Johnny proposed on December 25, 2010 and I happily said yes! A few readers have expressed interest in the wedding plans as they've advanced, so I thought I'd put together this page for you to follow along. Don't worry - Johnny only comes to the blog if I tell him to, and even then I'll make sure he knows to stay away from this tab! The wedding date is December 19, 2011. It's a Monday. Odd I know, but we had our reasons, plus I've been scoring some killer discounts because it's not a weekend! The ring: An emerald with princess cut diamonds in a white gold setting. The venue: Bear Mountain State Park in upstate New York. Our ceremony, cocktail hour, and reception are all going to be held in the merry-go-round pavilion. We will be married in front of the fireplace, then the festivities will continue in the open space and around the carousel. 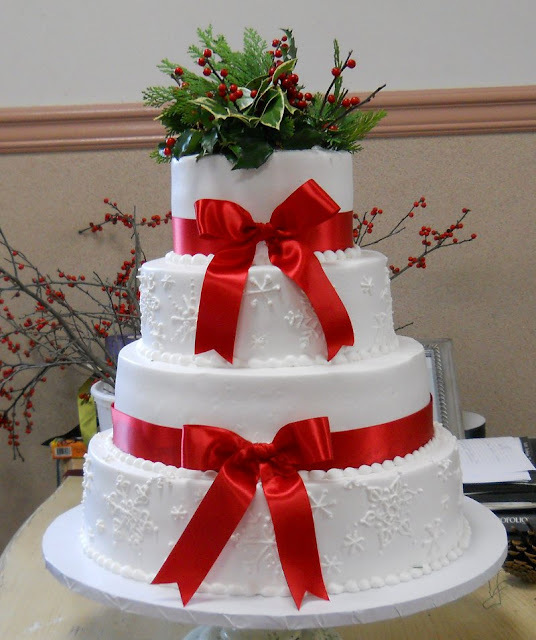 The cake: which is included in the venue! They work hand in hand with a local bakery that has a whole selection of cakes to choose from. This is the one I've fallen in love with, but I would do green ribbons in place of the red. 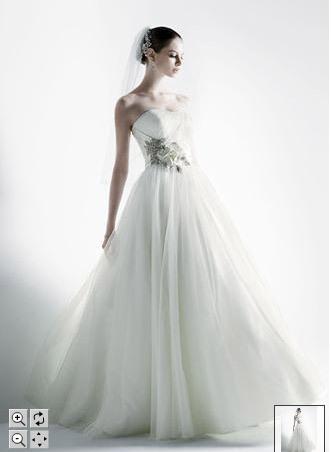 The dress: An Oleg Cassini ballgown from David's Bridal. At first I was against going to David's Bridal, so we went to a handful of boutiques. I found them stuffy, with limited selections and outrageous prices. This was about the 15th dress I tried on and right away I knew it was the one- I didn't want to take it off! The shoes: Again, the heels are from David's Bridal. I went back and forth on a bunch of shoes. I just could not decide. Eventually I realized I wanted to: a) have a cute little touch and b) the ability to try them on in person. These fit the bill, were the color I loved, and cheaper than all my other likes! The Vans are to change into for the reception so I'm comfortable as I dance the night away! I think that's everything for now! I still have a few things to decide on, but the rest will be do-it-yourself to save money. It is going to be an amazing wedding! Oh, and I wonder if there's a bus that takes you to that place from NYC? Oh I never thought of that Sophia! I took my pic down, just the model now! There's a train from NYC, I'll email you the deets! Your ring is GORGEOUS, Christina! Looks like I missed the pic of you in your dress, but I'll bet you were even more gorgeous! Your ring is making me jealous...in a good way. It's insanely gorgeous. =) I am so thrilled to see things are going so well with the wedding planning. I can't wait to read all about it at the end of the year. Cheers to your upcoming nuptials! Yay! I can't believe tomorrow is your wedding day already? Maybe after the wedding you'll let us know why you chose the particular date when it fell on a Monday! AMAZING, WONDERFUL wedding! Everyone said the BEST wedding they had ever been too! I agree --so much incredible dancing, great food, caring loving friends.... and better yet it lasted for days so we had extra time together in a perfect setting.